I'm a sucker for succulents these days! I love them for their organic and rustic feel, and for how they always seem to be perfect planted in unexpected containers like above. Once a sconce for pillar candles, now repurposed to hold succulents. In fact, seeking out the unusual containers to hold these wonderful plants is half the fun. 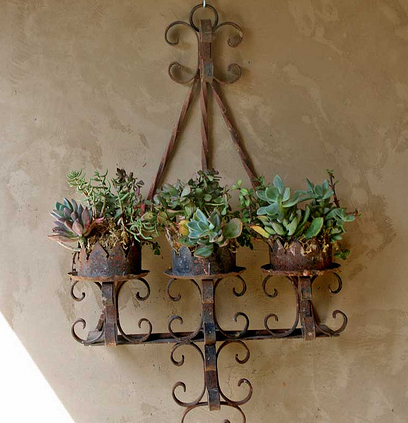 I'm inspired by how Sandy Koepke uses succulents in her design. 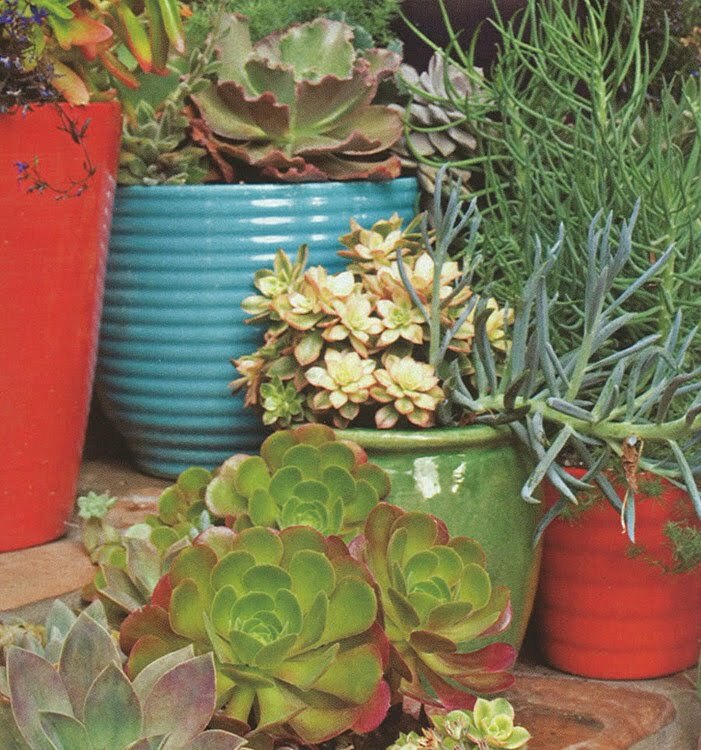 Here, she used colorful California pottery to hold a collection of succulents outside. 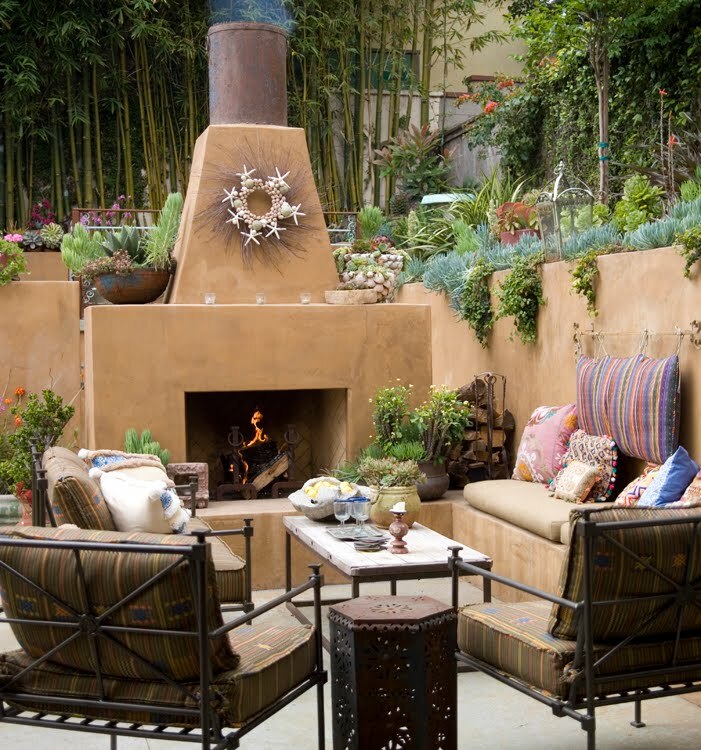 An outdoor room designed by Sandy Koepke, using succulents. These plants were made for our climate in California! My friend Lisa displays organic succulent arrangements on her windowsills. A collection of branches, moss and succulents, they are a wonderful juxtaposition to the silver collection in her formal living room. She retrofitted the sills with soapstone to accommodate them! The first time I saw a succulent wreath was at Lisa's house. She knows a talented florist who specializes in succulents and will make just about anything. However, the wreath above is from Viva Terra and can be purchased online for $89. They have two versions available. It's hard to resist this little guy! Viva Terra again for $79. 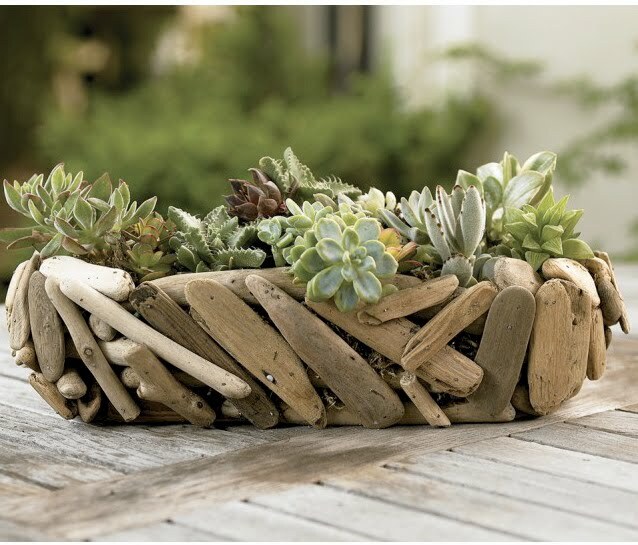 I'm loving this driftwood container from Viva Terra! At $89 though, I don't think so! They also have a trio of little plants for sale in cement containers. The three for $79. I picked up my trio of succulents for my kitchen window at Home Depot! Only $5 each, they are so sweet in their crackled pots. I just planted this container with succulents. It looks like it's made of stone, but is actually resin. I found it at Jo Ann's Fabrics of all places. 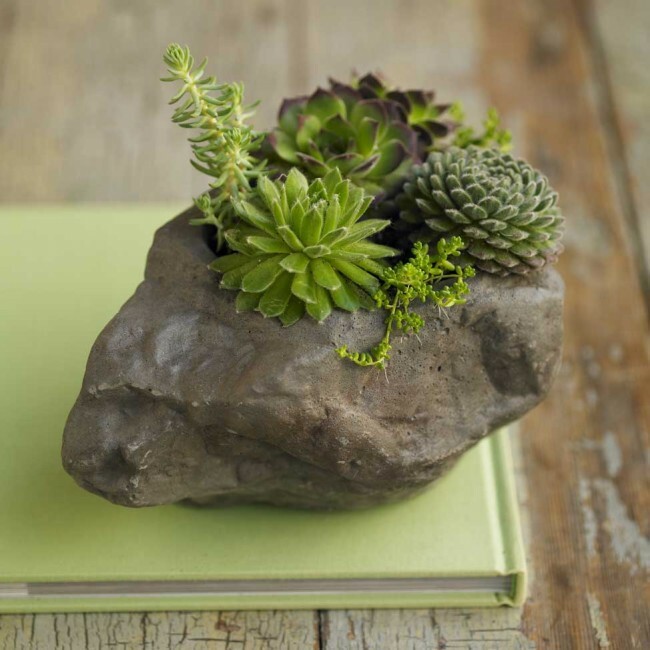 A similar version of my "rock garden" is available at Viva Terra online. 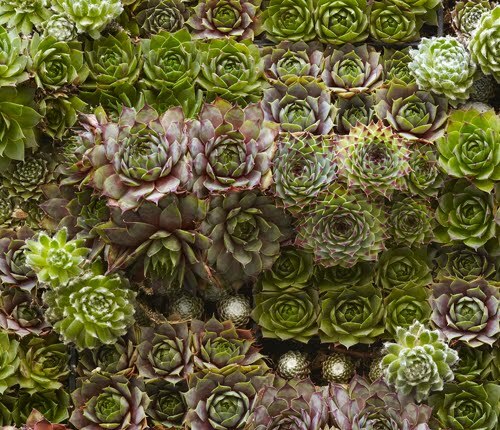 In the wine country, succulents are perfect because of the dry, hot climate most of the year. We planted quite a few containers last year, including the cement pillars outside the living room doors. 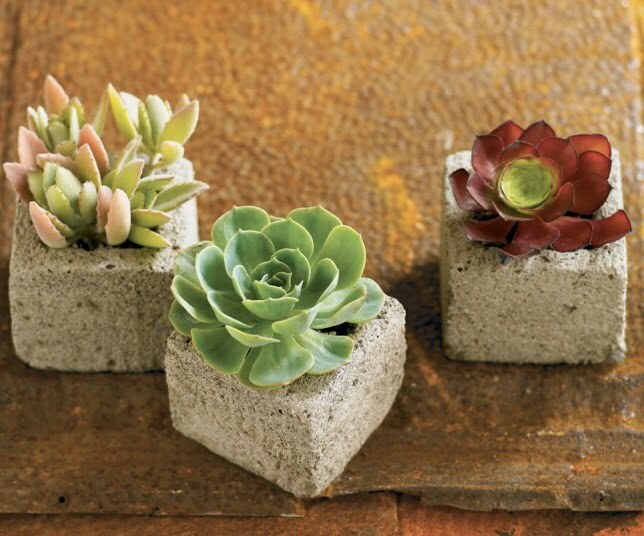 I had these cement containers from Ballard Designs forever, and when I planted them with succulents, they came alive! 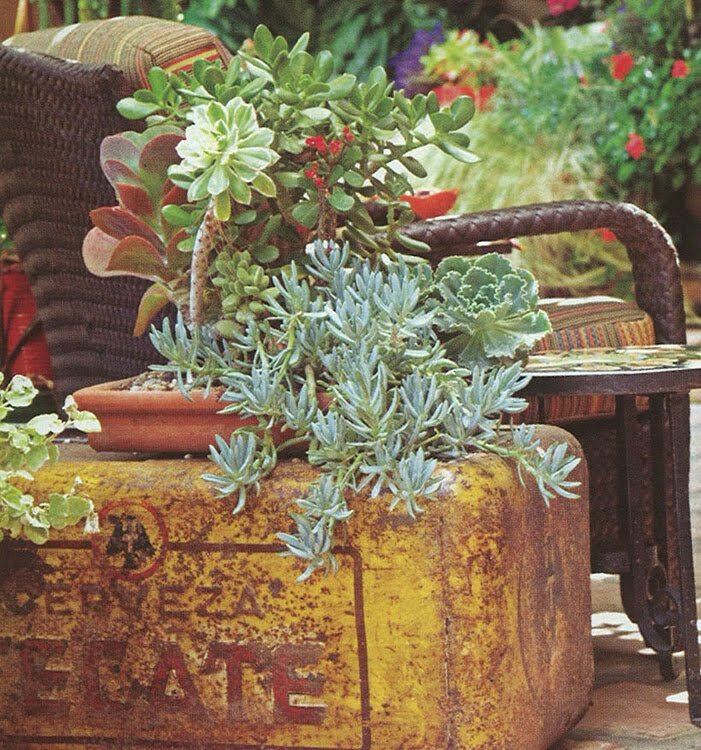 When I found this cement suitcase in an antique store, I knew it would be perfect for a succulent garden in Asti. It has held up well through the winter. 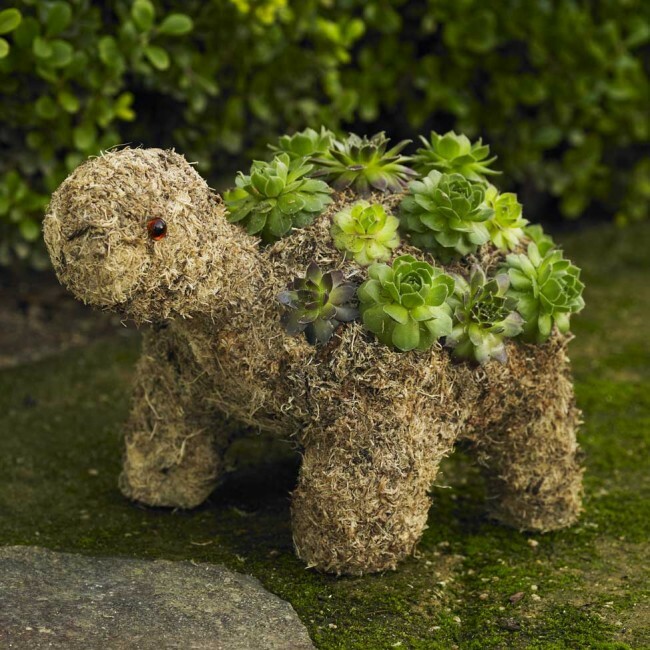 Succulents allow you to be creative. After all, how many plants can you make a wreath out of that will last almost forever! It's also fun selecting different varieties for arrangements. They come in so many different colors and sizes--all needing very little water! 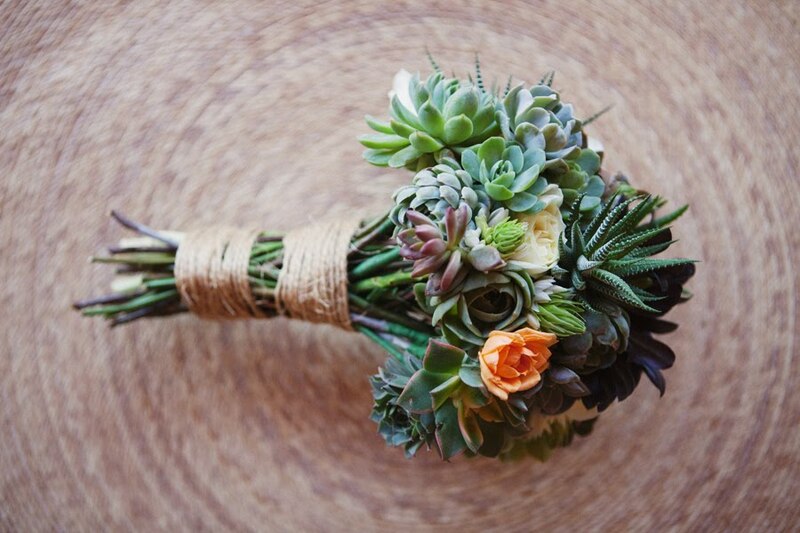 Succulents have even become popular for weddings. 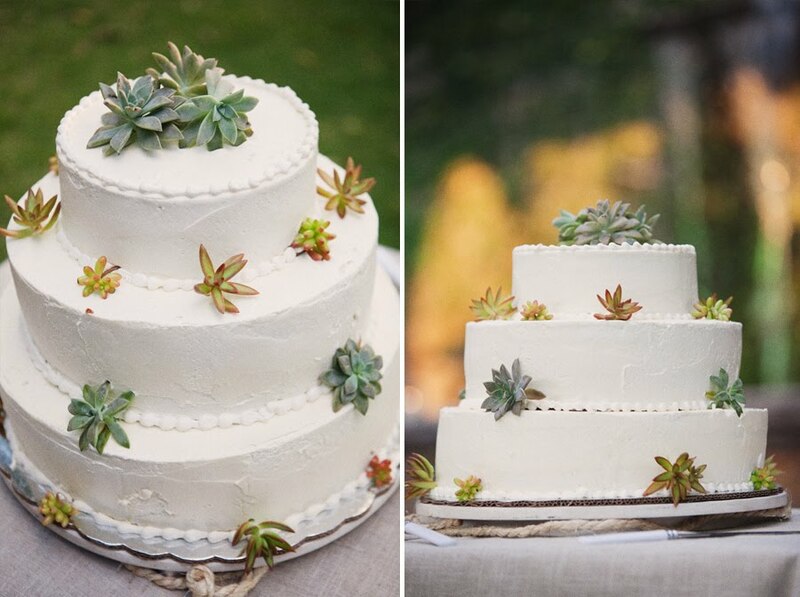 This particular wedding used succulents entirely. Click here to see one of the most beautiful weddings ever! 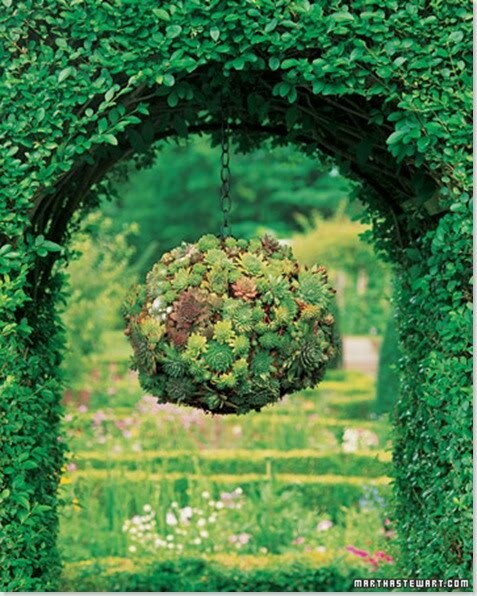 A wedding, or also a garden would be lovely with a succulent "kissing ball!" 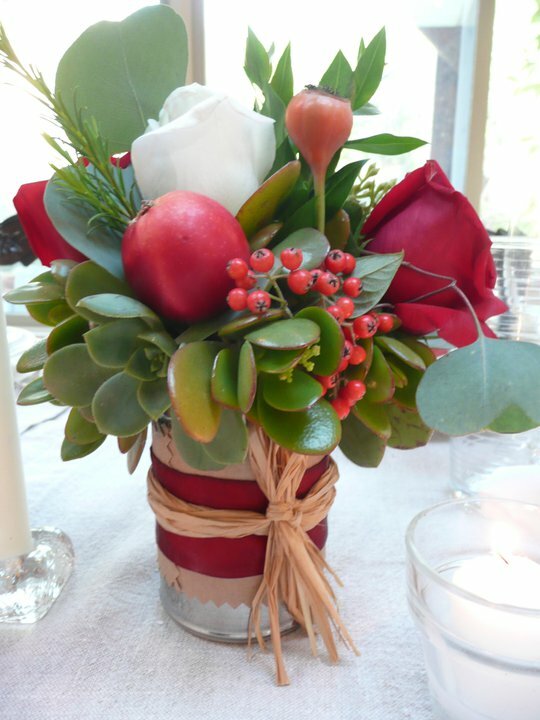 Succulents and flowers mixed together make for a lovely centerpiece for the holidays. So why are succulents so popular? 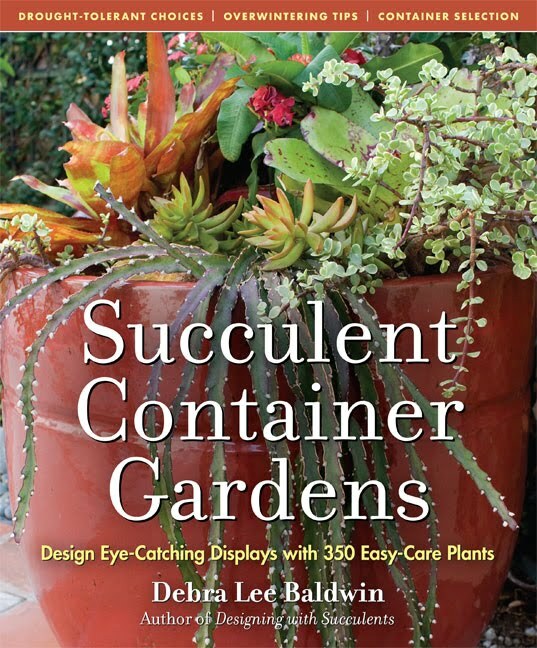 The "The Queen of Succulents," Debra Lee Baldwin says it is because they are easy to care for and draught tolerant. And because of their rosettes and geometric shapes with striking colors. I couldn't agree more! 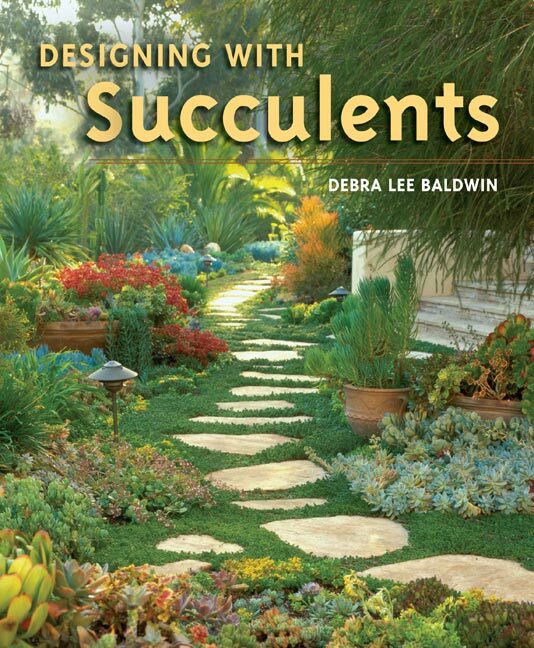 Her two books are a must, and a great place to begin if you are considering succulents for your home and garden. Both books are available on my sidebar from Amazon. Just one of the many conveniences I offer! So, how do you feel about succulents? Are you as crazy about them as I am? They're all just wonderful, I especially like the little turtle, puts a smile on your face. Delores, I love them and looks like I need to go to Home Depot. I've been wanting to try some in my garden. But don't think they will withstand the winters here in Oklahoma. I think those wreaths are fantastic. So glad you mentioned that online store. I didn't know about it and they have lots of good things. I've had a pot of succulents on my deck for the last couple of years and they always look beautiful, especially in the heat and drought of our summers. 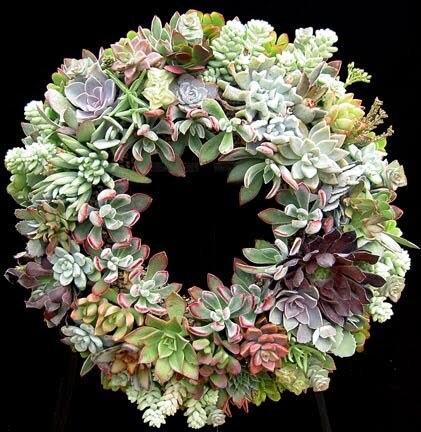 Delores, I saw succulent wreaths for sale at Lowe's at Christmas. Wish I had brought one home. The thing I love best about succulents is the word itself - ssssucculent! and how easy they are to propagate. I am I am!!! Wow the ideas are fabulous. I've got some growing in concrete bowls that I made myself, and they are perfect in the hot and dry heat we have here. And now I want more more more! happy wednesday. I found the lovliest and least expensive on Etsy! I love them! How cute is that turtle! I love them too and have many different varities.....thanks for the inspiration! Thank you for sharing! I love all the inspirational planters especially the suitcase. I am going to check out those books because I have become a fan of these plants. Succulents are the only plants I can keep alive long enough to truly enjoy. I'd love the picture of the outdoor California room with the fireplace. I just want to go there and have a glass of wine with friends. Your pictures always make me drool! 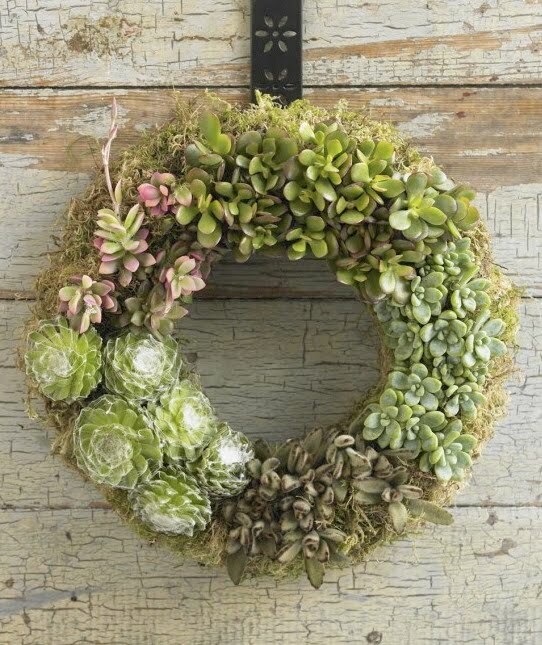 Those succulent wreaths are just beautiful! I love this post it was very cool and amazing. You are very creative. 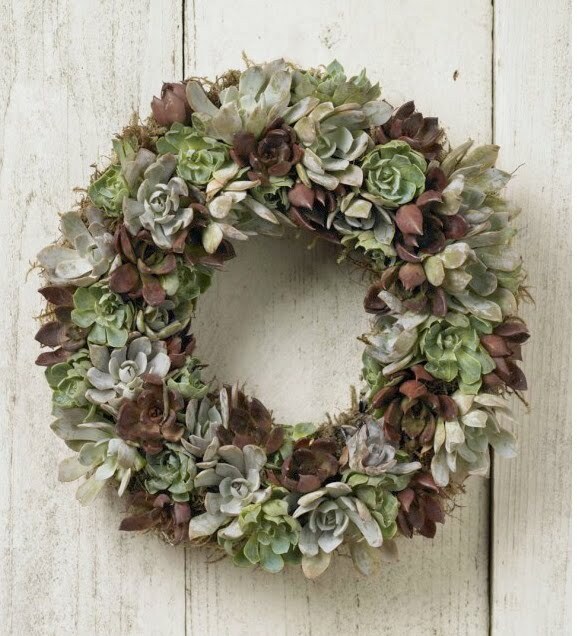 I love this entire succulent wreath. Thank you for sharing and keep posting.